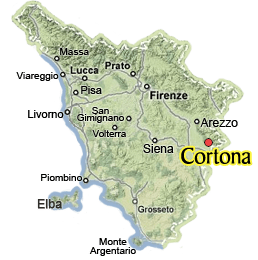 Just in case you hear the pitter patter of raindrops, it may be an idea to visit the international photography festival Cortona on the Move – photography in travel, which is being held in Cortona, Arezzo, Tuscany from 17.07.14 until 28.09.14. See the map below to get a measure of distances. For example, from Piombino on the coast to Cortona, you are talking about a car trip of about 2 hr. 20.